This week, Imaginatik and the Center for Innovative Collaboration and Leadership (CICL) at Suffolk University are jointly launching the Collaborative Innovation Awards 2017 – the inaugural year of what we expect will become an annual awards program! This effort has been a long time in coming. Over the years, our two institutions regularly come across brilliant innovators, doing brilliant work. Some of these folks are entrepreneurs, or inventors, or even celebrities. But most work within large organizations. And few, if any, of them get the credit they deserve. To that end, CICL has been giving a similar award for the past few years, but the reach had been limited. With Suffolk CICL and Imaginatik working together in industry-academic collaboration, we aim to change that. No startups, please. There are lots of awards programs for entrepreneurs and inventors – but comparatively few (if any) for corporate innovators. We’re determined to re-balance the equation. Honoring the innovators themselves. We don’t care which large organization you work for. We only care about the quality of your innovation efforts – and your results. The importance of collaboration. Within a large-organization context, collaboration is vital to game-changing innovation. So we’re making it an integral part of the judging criteria. Crowd participation. Awards programs shouldn’t happen behind closed doors. Crowd participation will be instrumental in every aspect of surfacing, vetting, and selecting the winners. Around the world, there is a large-but-silent cohort of “corporate” innovators – in industry, government, and non-profit. These people do courageous, selfless, and vital work. They drive major sources of new value – for their firms, for the economy, and for society at large. Yet in most cases, the innovators themselves receive neither meaningful recognition, nor personal gain, from their efforts. More often than acclaim or personal success, these innovators struggle to justify their work – sometimes left adrift to fight for their careers. Meanwhile their employers, despite understanding the importance of their work, struggle with how best to recognize their efforts. Everyone is fighting against the culture of “business as usual” – often with no good answer. 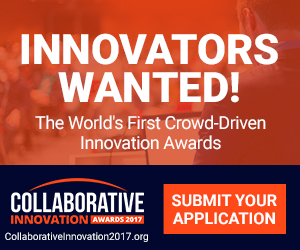 Through the Collaborative Innovation Awards 2017, we intend to shine a bright light on collaborative innovations – which might otherwise remain under-utilized, or unheralded. In so doing, we aim to raise awareness around the importance of corporate innovators – and thus make it easier for their continued work to further benefit their companies and our society. Ambition. Great innovations aim to solve BHAG problems. We want to see the heart, brains, and brawn needed to breathe game-changers into existence. Collaboration. Even the “lone genius” inventor story requires a supporting cast to help the invention spread in the marketplace. We want to know about the underlying teamwork that led to your amazing innovation. Ingenuity. Innovation is an act of creation, requiring a high degree of ingenuity. We want to see evidence of highly creative problem-solving powering the final innovation. Impact. History is littered with “innovations” long forgotten. We seek compelling evidence that our world will never again be the same – fundamentally changed for the better – because of your innovation. Crowd voice. We are fervent believers that experts do not have all the answers. Crowd voting will count for 20% of the final score in both the preliminary and final rounds of this competition. It will also count for 100% of the Crowd Favorite award. To submit your innovation for consideration, please register an account here. Award submissions will remain open through March 10th. If you have any questions before or during the program, please feel free to contact lisa.falcone@imaginatik.com.